All this is not documented by JQuery Mobile, so it might change in the future versions. Ram – very nice, this saved me a lot of headache! Curious, what if I wanted to capture a value of a list item, or even the index of which item in the list. I’m not finding an easy way to do that. And one other question. My app needs to call the select menu possibly a few times, with different items in the list each time possibly. I attempted to do a $(newMenu).remove() after it is closed, but the next time createmenu is called, it does not like that. Is there a clean way to destroy and recreate the menu each time? I am trying to extend it so that I can add anchor tags to the list items, but I can’t find a convenient way to do this as it is. I could pass the create function an array or a string as you did and then add them to the options, but somehow I don’t like the idea. Great job by the way. The jQuery Mobile select menu is quite useless if you can’t access it programmatically and you addressed that. Thanks for that. It might help if you describe how you want to add anchor tags. I have used a global variable newMenu, but if you make it a local variable inside createMenu function, then you should be able to create multiple menus by calling createMenu function. This function already returns the menu instance. how to close the menu?? I have updated the code to add ‘X’ to the menu header to close it. I am no expert in CSS, so could not style it properly. Thanks a lot for quick solution! Is it possible to make that menu list scrollable??? I have also updated the post. I tested it in Chrome and IE and works fine. You may have to debug the problem at your end. Note that if height of the scrollable div (as specified in scrollableDivHeight variable) is greater than height of the menu, then scrollbar won’t appear. And I am assuming that you have set variable scrollable to true. Yes, it does not work on mobile. I have removed this code from the post. Actually if there are many menu items, then the menu can be scrolled with the entire page. But I guess you don’t want that. The code that I posted earlier for scrolling kind of works on mobile – menu items are displayed in a div with fixed height, but scroll bar is not displayed. So there is no way to scroll menu items. I can’t think of any quick and easy solution. To create the show menu to one of the jquery chart applications how to link of the next process? If I understand your question correctly, you are asking how to show menu on JQuery chart. If so, the process is similar to what I described in the post. 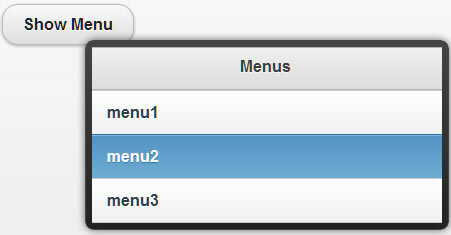 It is two step process – first you create the menu, with createMenu function. Once created, it can be displayed by calling showMenu function. In your case, you may call it in any event handler of the chart. HI Ram, firstly great work on the popup menu is just was I was looking for. Just to follow on from @Wills comment re: JQM 1,2.0 even after the change to the filter it still doesn’t show the menu. After inspecting the html I can see a parent div with class ui-selectmenu-hidden that kind of shifts the menu way off screen. If you select the parent and remove this class you can get it to appear by adjusting the top and left (not sure if this is the best approach). I think it would be worthwhile updating your post with the latest versions of JQuery and JQM as it is still a great solution for a simple to build dynamic popup menu. I have updated the post. Now the code should work with JQM 1.2 and JQ 1.8.2. Hi, Ram, this is the best solution I found after several days of reading. Would it be possible to filter menu data? Tnx in advance! hi, ram this site(http://ebager.dk/beting1.aspx) dynamic dropdown menu possible? If you are asking where you could use pop-up/dropdown menu on your website, then I would say I am not an expert in UEx design. If you are asking if pop-up menu explained in this post could be used on the web site, then the answer is yes. But note that the menu is created with JQuery Mobile and meant for mobile sites. Having said that, nothing stops you from using it on desktop sites. I tried to call the select menu programmatically, But trigger & click are not working. Can you suggest any workaround? I’m using native select menu.